Person of interest in priest's death. Police are seeking the public's help in identifying the man. Officials have released a picture of a man considered a person of interest in the death of a retired Massachusetts priest found dead in Willacy County. Pastor William Costello disappeared from the Tiki Condominiums on South Padre Island on Aug. 1. Also missing was his small dog Grace. His remains were discovered on Aug. 17 in a remote area between two levees about three miles east of Santa Monica. Juan Carlos Baez Escobedo, 27, of San Benito, is being held on $2 million bail charged with Costello’s death. He is also charged with tampering with physical evidence. Earlier officials said they were searching for several suspects. 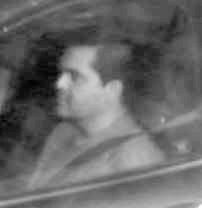 A photo released by the Texas Department of Public Safety shows a man with short dark hair driving a car. They also released a picture of the priest’s 2009 Honda Accord. Anyone with information is asked to call the Texas Rangers (956) 565-7651 or (956) 565-7600.